14 January 2005 represents a milestone in space exploration. At around 11:30 UTC the Huygens probe successfully landed on the surface of Titan - making it the first probe to land on an object in the outer Solar System. Mission Timer Unit (MTU) activated the Huygens probe. Cassini turned to point the HGA at the landing site in order to communicate with the probe. Communications would last for a maximum of 4h 36 minutes after interface at which point Huygens would pass over the horizon relative to Cassini. 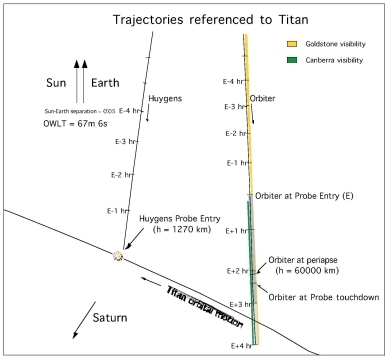 Trajectory of the Huygens Probe and the Cassini Orbiter from Entry - 7 hours until Entry + 4 hours, in the Titan reference frame. The mission is thought to have followed the pre-mission schedule (listed in detail below) reasonably accurately. The only real variation is the surface descent phase took 2h27m50s as opposed to the pre-mission estimate of 2h21m. It will be some time before scientists full assess the descent profile taken by Huygens - although there is lots of information to work with. Alongside the spacecraft instrument readings the descent of Huygens was tracked by radio telescopes around the world, which monitored the carrier signal sent by a transmitter activated when the first parachute deployed. The confirmation of the detection of this signal by the Green Bank 110m dish at around 10:30 UTC was the first indication that the mission had gone to plan. From interface altitude at 1270 km the probe desecened through haze until an altitude of about 30 km above the surface. This was around half the altitude suggested by pre-mission estimates of between 70 to 50 km above the surface. At an altitude of 700m above the surface the descent lamp was activated. The purpose of this lamp was to not to illuminate the landing site, the light levels on the surface of Titan are roughly 1000 times less than sunlight and 1000 times stronger than a full moon, but to provide a monochromatic light source and enable scientists to accurately determine the reflectivity of the surface. The landing on the surface was soft meaning no damage was done to the probe. Early indications are that the surface where Titan landed consists of a thin frozen crust that is around 10 cm thick with a less dense layer benath. 11:12 + 02h 06m Titan-C orbiter closest approach. 13:37 + 04h 31m Orbiter stops collecting probe data. 13:39 + 04h 33m Write protect probe data partitions. Partitions A5 and B5 of Solid State Recorder are protected from further data writing.